Aisling had a long, but fun St. Patrick's Day. We left the house at 7 am to drive over to Craig's place in Plain City so we could caravan to Dayton. 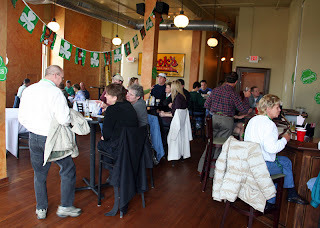 We started out at 9:30 in the morning at the Dublin Pub in Dayton. 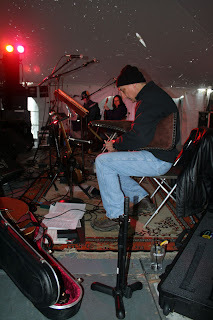 We were out in the big tent, where it was freezing cold on stage, but warmer out in front of the stage. 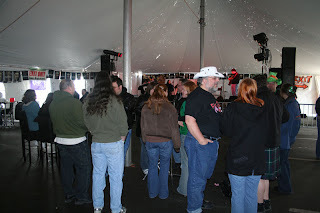 The crowd started building after we started our set, but they seemed to be more interested in drinking than listening. 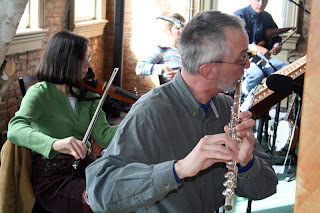 Here's Mary snapping photos of Craig doing his uillean pipe solo. No, she's not working on an appliance repair . 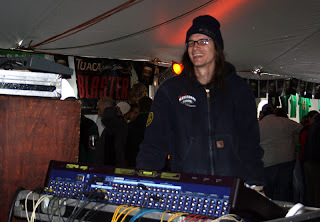 . .
Sound guy, Robert. 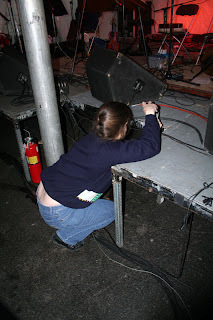 It's always nice to have a sound system and technician provided. The rest of the day we had to provide our own sound system, and we had some challenges getting the mix and volume right. Steve and Carol Smith. You can tell how cold it is by how bundled up we were on stage. Of course, if you start drinking beer at 5 am, you're feeling pretty warm and unhibited by 10:30 am. I think this is Ken. Hello Ken! Welcome to the Aisling weblog. 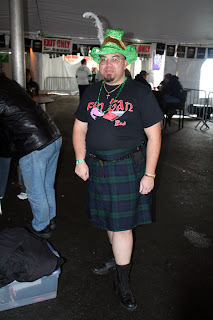 There seemed to be a lot of unhibited attendees at the Dublin Pub, including a piper who came in during our set and commenced playing pipes at the entrance to the restroom in the back of the tent. After several minutes, the management went and told him to pipe down because we had a concert going here and all. . . Geez! After our Dayton gig, we rushed back to town to grab the sound system and then we were off to Westerville for a two hour set at the Old Bag of Nails Pub. We played up on the third floor, which was a nice space. We didn't have to contend with a wayward piper, but we were up against the NCAA basketball championship tournament. 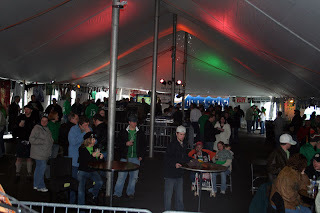 We did have a lot of cheering and applause at odd moments during our set, but, hey, we'll take it like an Irish band. . . Here's some of the afternoon crowd. They seemed pretty nice. Now, this has got to be interesting. . . Yes, indeed. 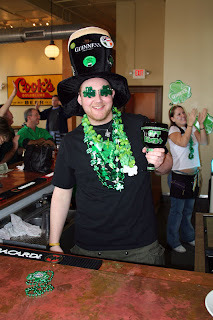 This was the upstairs bartender in full St. Patrick's day regalia. 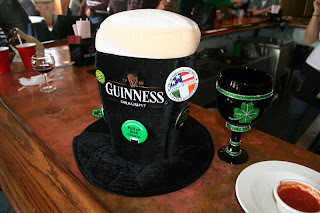 What is it about green beer that has this effect on people? Steve, Carol, and Craig playing "Sally Gardens." These were a couple of Mary's friends who came to grade final exams while listening to our music. 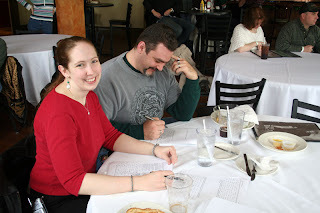 Faith Ann said the scoring would be much more favorable since our music put her into such a good mood. The evening was capped off at the Groveport Town Hall. 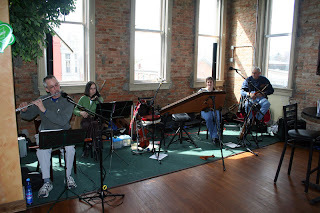 We've been playing here for several years and always enjoy ourselves. 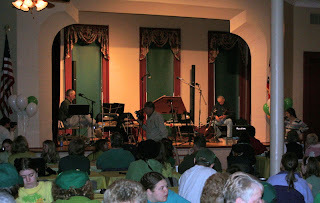 Linda Haley and the staff at the town hall do an excellent job of running a St. Pat's party. They start the evening with crafts for the kids, then have a dance troupe in to demonstrate traditional Irish step dancing. Traditional corned beef and cabbage is served to all attendees (no charge! 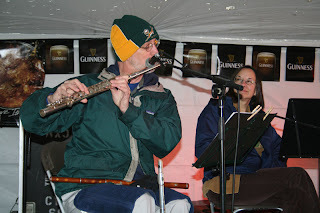 ), and then we play traditional Irish music. The crowd gets bigger every year, too. Thanks, Linda!